← Finally, a solution for my keyboard dyslexia…..
A goldfinch with his winter coat. I'm not impressed! Alone at last for a well-deserved repast. 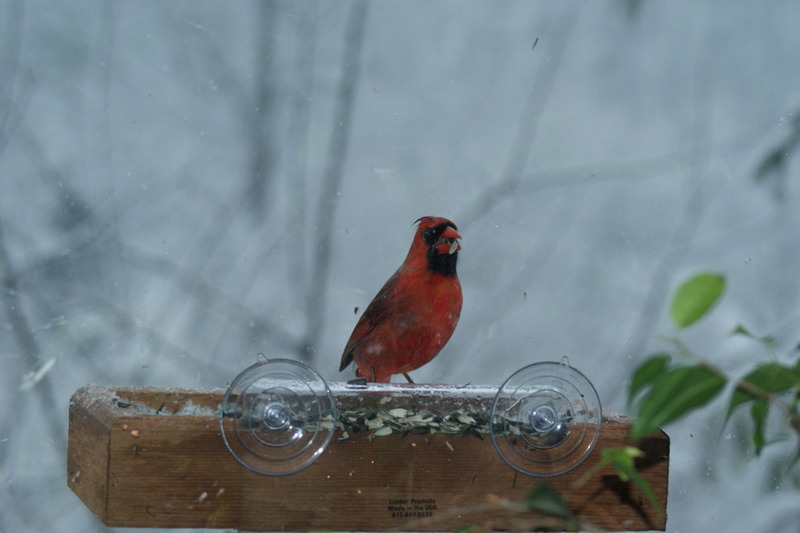 This entry was posted in Misc and tagged Bird watching, Cardinals, Goldfinch, Woodpeckers. Bookmark the permalink. Beautiful photos! Did I tell you about the red bird we saw in The Gambia? Are you sure it wasn’t in Senegal? If ti wasn’t flying east and west it was not in Gambia. 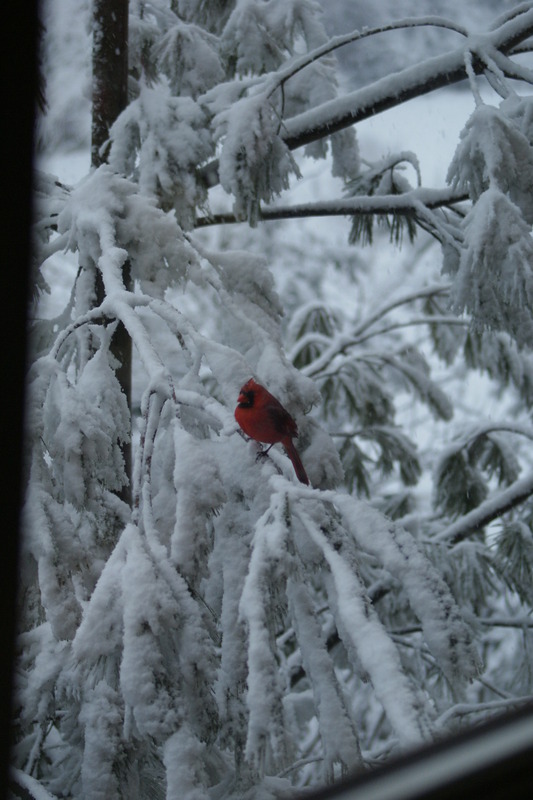 I don’t think ist was a cardinal bird, just a bright red one! Definitely was The Gambia, I’ve only been to Gambia and Egypt in Africa, so far! Closest I have come to being in Africa was a view of the Atlas mountains as our ship transited into the Med. That must have been amazing…. was it summer? Yes. We stopped off at Gibraltar for R&R. Great port of call. What lovely pictures! 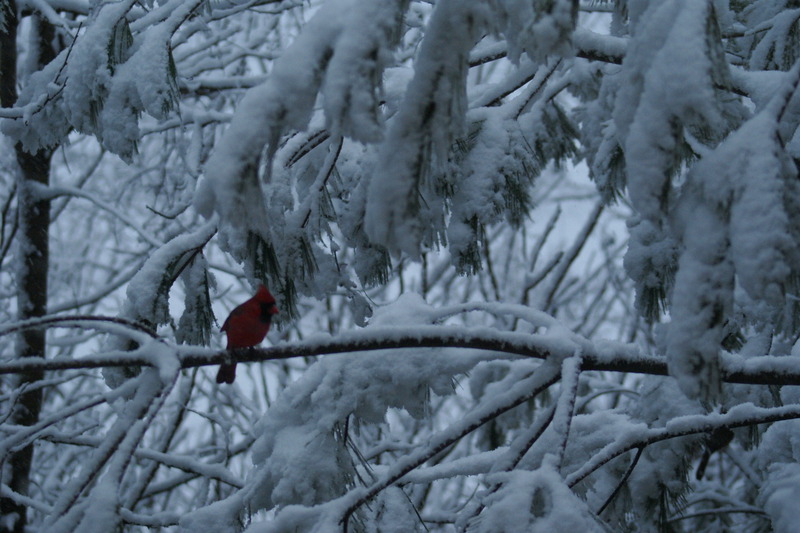 We see quite a few cardinals on our road, and yesterday I saw a blue jay as well. Spring! Spring! Spring! what a delight. 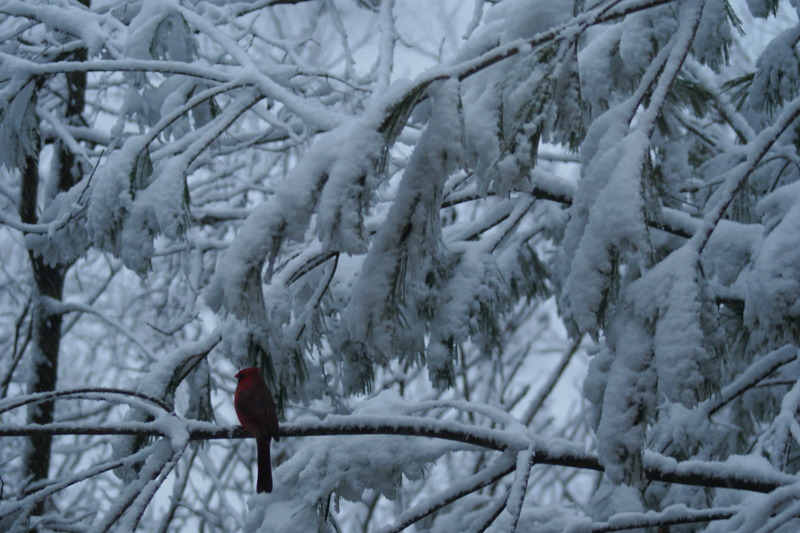 I love cardinals and their bold songs. This made me smile. Of course, it also makes me happy that you have snow and all ours has melted. C’mon spring. Actually, these pictures are a couple of weeks old. We are now enjoying temps in the 70s and 80’s. Thanks for the comment. I loved these. Wonderful to see that red against the white. I’m glad you feed them. I liked that contrast too. They pay us back by providing entertainment. 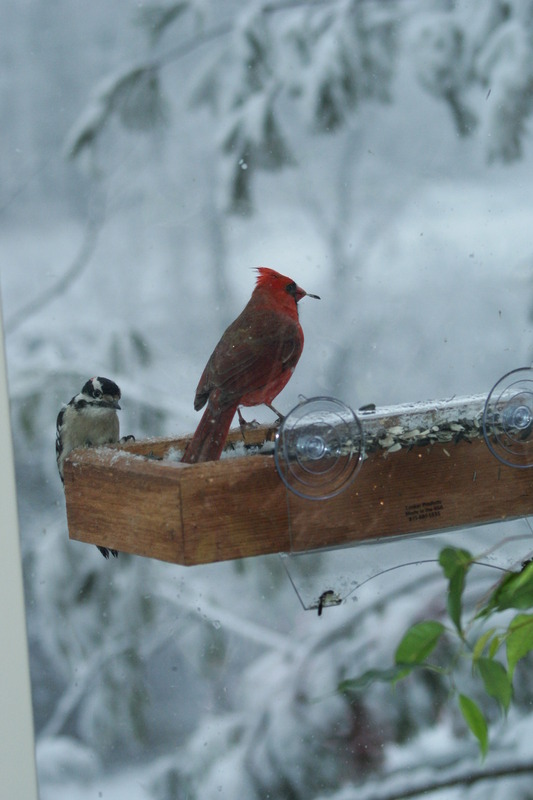 People are always telling me my blog is for the birds, so I figured……. Beautiful pictures. 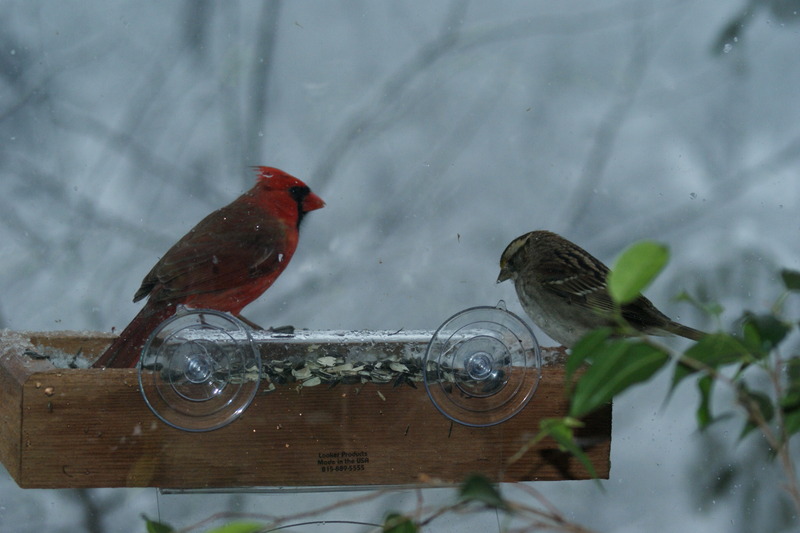 I have a pair of cardinals (or they have me) and I treasure them. I wish I had the beautiful snow you have. You must live in the south, because I live near the Canadian border and we haven’t had any snow this year! Yes, we’re in Virginia. We had a couple of 5 inch snowfalls late in the season. As an Elmira boy, I remember when upstate New York was the snow capital of the world. Not so much anymore, I guess. Snow, did you see snow this year? Where for goodness sake? Love the photos. I am bird crazy. Especially woodpeckers. We’re in Charlottesville with your granddaughter. 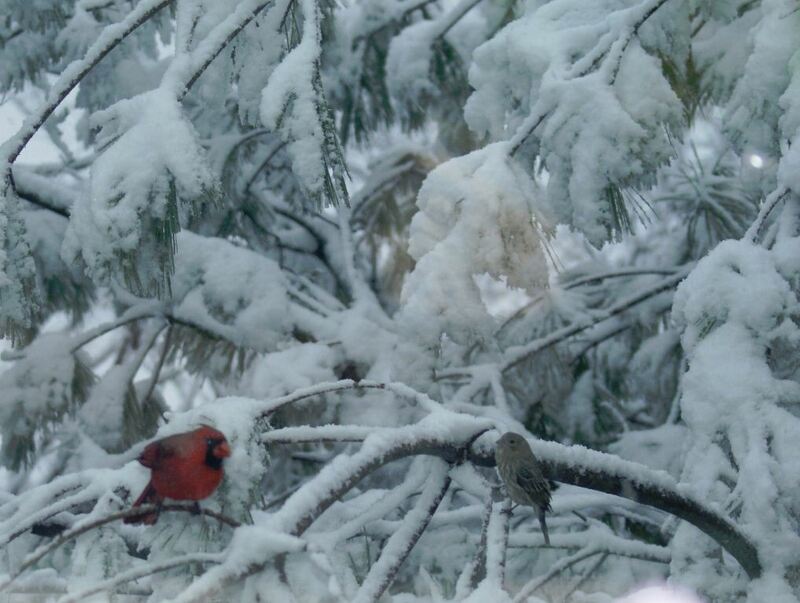 Didn’t she tell you about our snowfall? My lovely wife gets credit for the photos. Thanks. Yes, they are very jumpy birds. If they see us moving inside they fly away. By the way, your comment showed up in my spam folder this time. Wonder why?